During the night of 31st January and 1st February 2017, Northern Lights were visible all night – despite a few thin clouds – above large parts of Northern Finland and Scandinavia. My photos from that night were published today in Finland's largest newpaper "Helsingin sanomat" in print as well as online: "Revontulet sykkivät mystisesti". 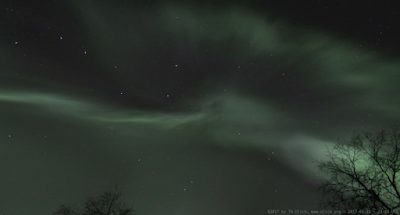 The article tells about the current research collaboration between Sodankylä Geophysical Observatory and a few Japanese research institutes to study so-called "pulsating aurora", which refers to flickering patches of aurora. Recently, I built a small camera system, which is able to take photos continuously for a long time. During said night, the camera was pointing almost straight up resulting in a short time-lapse film of about one minute duration. The film is composed of images taken over 9 hours at a rate of four photos per minute, and it is linked from the article mentioned above. In the video you can see several distinct shapes of pulsating aurora drifting through the image and flickering at the same time. The camera was pointing in a direction of 75° elevation above the southern horizon to capture the auroral corona. The corona can be observed when the northern lights are almost directly overhead and one can thus look into the auroral arc or curtain. From this point of view it looks as if all rays of the aurora come from the same point in space. In reality, however, the rays are parallel, and the corona is a result of perspective. The same effect makes a long, straight road appear to become narrower in the distance, which of course it not the case. The photo above, taken by Eric Donovan of University of Calgary, Canada, with a fish-eye lens, illustrates the perspective effect of the corona. 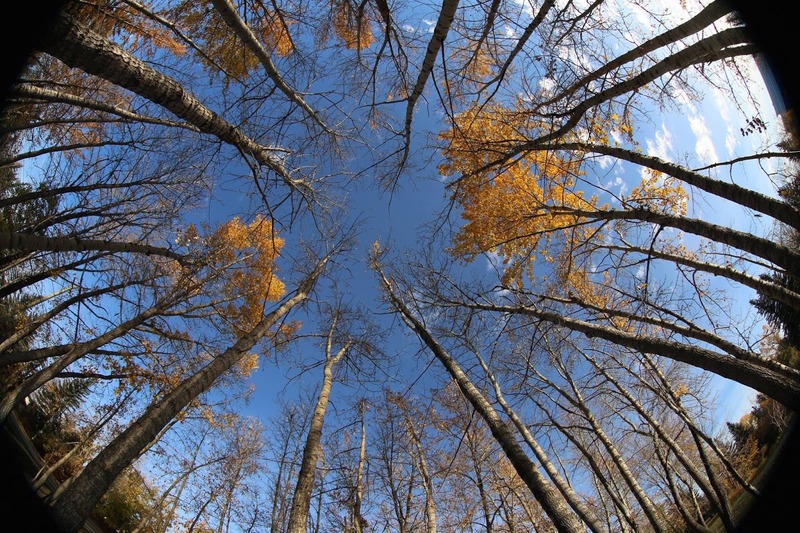 The trees seem to grow towards a single point in the sky, but they are parallel in reality. Thanks to Eric for allowing me to use his photo! You can find some more films of the Northern Lights of that night on the blog of the Sodankylä Geophysical Observatory (SGO). There's the film from the scientific all-sky camera, a two-camera composition by our friends from Site-Eye Ltd, UK, as well as an impressive fish-eye footage by SGO's Esa Turunen of early-morning pulsating aurora. Have a look! Film and text: @2017 by Thomas Ulich.